The abyss does not underlie things, but rather allows things to coexist: it is the nonspatial “betweenness” of things. Whenever I put my hand into the toaster oven I am thrusting part of my body into an abyss. Comedy is a man in trouble. In arguing with Niels Bohr over the completeness of quantum mechanics, Albert Einstein used a thought experiment known as the EPR paradox, which involved a pair of particles so deeply linked that they share the same existence, so any measurement on one immediately affects the other, regardless of distance. According to special relativity, this was impossible, and so Einstein argued that quantum mechanics was wrong or incomplete, famously referring to this interaction as “spooky action at a distance.” This paradox was resolved by thinking of this linkage as entanglement, a new, “nonlocal” kind of phenomenon. What once seemed impossible or inexplicable occurs because the two entangled particles are connected despite their distance, together while apart. The work of the artists in this exhibition creates a kind of comedy out of this sort of uncanny connectivity, rooted in objects but also in representations, collapsing the distance between thing and idea, and using punchlines and pratfalls to draw connections and upend expectations. In Todd Kelly’s paintings, fields of color and pattern are traversed by a cartoonish figure who is often accompanied by his doubles, or instances of himself at different moments in time. Sometimes speaking himself into fuller existence, at other times tripping himself up, this figure bridges space and time, existing in different moments within the otherwise simultaneous space of painting. The line with which he is rendered is similarly time-traveling; appearing quick and loose like a doodle in the margin of a notebook, it is actually arrived at through a process of preparatory drawing and tape-masking which is only revealed by the physicality of the line’s surface. While there is a kind of violence to this slapstick humor, the line and color render it oddly joyful, as if the figure, existing both in the moment of leaping and the moment of falling, cannot help but laugh at his predicament. Ben Pederson’s work imagines sculpture as a platform for and network of other sculptures. 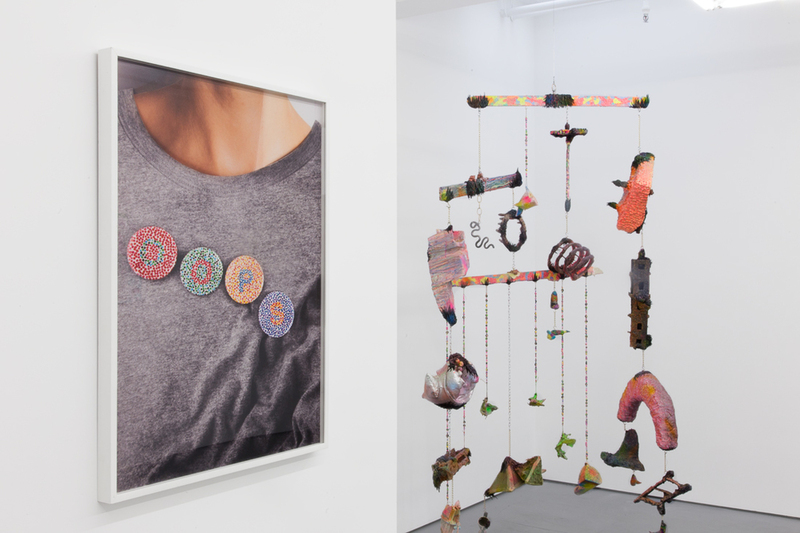 Whether in freestanding objects or hanging mobiles, he connects various forms of thing-making to one another, generating a physical comedy through the juxtaposition of disparate objects and radical shifts in scale. These shifts are both physical and conceptual, including both miniature representations of seemingly monumental objects and tiny things produced at actual size. While rooted in fundamental sculptural issues of weight and gravity, his work complicates those issues with an approach to color akin to dazzle camouflage, and an interest in connecting different traditions of object making, from the modernist tradition of the found object to the vernacular sculptural tradition of adolescent hippie bead-making. In Jennifer Grimyser’s work, the photographic surface connects and flattens objects, even while the multiplicity of actual and rephotographed surfaces in her work draws our attention to the gaps and discontinuities between things. An actual hand and a photograph of its partner are entangled in the act of supporting and being supported by an unfired clay vessel, either an actual vase or a miniature sculpture of a volcano. The word “NO” is entangled with its opposite, itself rendered in reverse, and the interior patterning of security envelopes is reflected in the conventionally “marble” patterning of a composition book. This back-and-forth between the physical and the verbal, the real and the representation, generates a kind of quantum comedy, in which things are always both themselves and not.